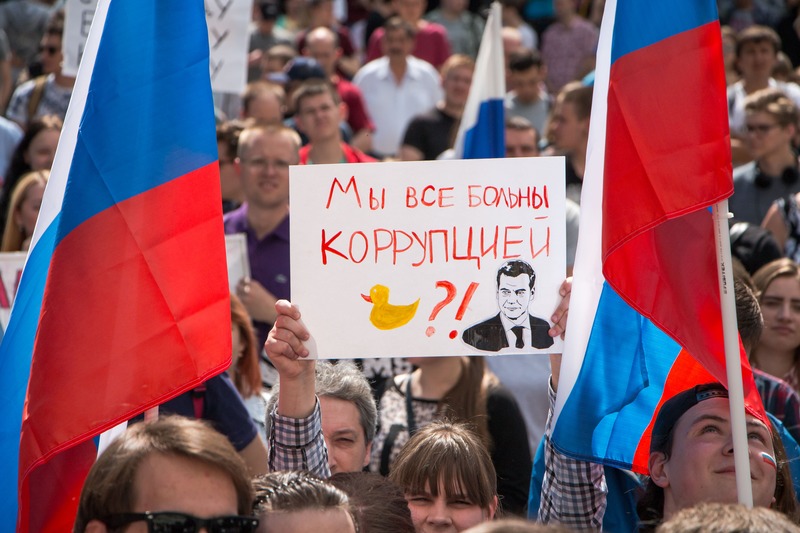 Russia needs an «anti-corruption revolution». Today, corruption has turned into a far-reaching, devious system that allows certain small groups of oligarchs and bureaucrats to appropriate the results of economic activities. Corruption threads the Russian state system from top to bottom, emburdens the business and the population and prevents economic growth and diversification of the economy. All citizens of Russia are now paying a corruption tax — in form of direct bribes to government and security officials, limited access to markets and infrastructure, overly high prices and inefficient spending of budget funds. We have everything we need to significantly reduce corruption levels. We lack only one thing — political will. The fight against corruption is the main structural reform both in the political and in the economic sphere. If it doesn't succeed, other reforms will not have the desired effect. The conditions for an successful fight against corruption are freedom of mass media, freedom for the activities of civic and political organizations, political competition, fair elections and alternation of power, independence of courts, decentralization of power, abolishment of excessive regulations and reduction of the state's role in economy. To create a special anti-corruption structure that would not be a part of the system of law enforcement agencies — an independent Anti-Corruption Agency. The head of the agency will be appointed upon consent between the president and the State Duma. The commission must also conduct a monitoring of the existing legislation and institutional regulations on the subject of corruption potential; such procedure must become obligatory for all future laws. To fully and unconditionally ratify the UN Convention against corruption, including the articles concerning the fight against illicit enrichment of officials; Russian legislation will be modified to conform with the Convention. Civil servants of any rank and any branch of power, whose expenditures (or expenditures of their closes relatives) are higher than their confirmed incomes will automatically be put under trial. The punishment for concealing incomes and property will be upgraded. To extend the statute of limitations for corruption crimes and economic crimes against the state and private individuals from 10 to 20 years in case the damage exceeds 10 million dollars. To ensure complete transparency of the activities of state companies, which are now the hotbed of systemic corruption. The management of state companies will be treated equally to government officials in terms of regulations regarding disclosure of incomes and expenditures. To increase control over the activities of state companies and ensure the fair use of incomes from owning their shares or their privatization, a package of bills will be developed. These bills will include transferring these assets under control of a special fund — the Future Generations Funds controlled by the Pension Fund. To activate international cooperation in the fight against corruption and search for Russian money that was stolen as a result of corruption crimes and siphoned abroad. To introduce and tighten laws regarding disclosure of conflicts of interest, lobbyism , standards of disclosure of information (including information about ultimate owners) by companies providing services and goods to the state and state companies. The most important part of deconstructing the authoritarian-oligarchic model and fighting systemic corruption will be reducing the state's involvement into economy as an owner and an operator, increasing the efficiency and transparency of control over the property that will remain under state control, fairly distributing the incomes from it and effectively managing these incomes. The «state corporation» type of legal entities will be abolished. The assets of state corporations will be returned to the state, and the companies themselves will be reincorporated as joint-stock companies and will be managed under standard corporate procedures with regard to the legislation concerning the regulation of state companies. State companies and state banks will need to sell their non-core assets. The state's share in state banks must gradually reduce. The share of companies, real estate and land owned by the state and municipalities will reduce as well For every asset that remains under state ownership, a public reasoning will be prepared. Special publicity standards will be developed for managing state property. For choosing the heads of state-controlled companies and banks, as well as independent members of the board of directors, new open bidding procedures will be introduced. State-owned stocks of shares in major companies will be transferred to the Future Generations Fund, a subsidiary of the Pension Fund, and the incomes from managing these stocks or their privatization will be included in the resources of this Fund, the goal of which will be to increase the stability and fairness of the pension system. This will allow to put the management of these stocks and the use of correspondent incomes under strict public control.